Size: 3.8" x 2.4" x 0.4"
This Canon LC-210L was manufactured mid of 2002 and gives a good example of the calculator technolgy used in that era. The single-chip calculator circuit is bonded directly to the printed circuit board (PCB). A small blob of epoxy covers the chip to protect the tiny bond wires. The Chip-on-Board (COB) technology was used in calculators since the 90's, don't miss the Canon LC-37. 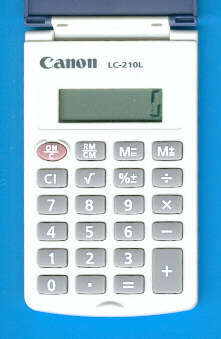 The Canon LC-210L continues a calculator line started with the LC-20 around 1980 and creating e.g. the LC-23 and LC-25H. © Joerg Woerner, November 16, 2008. No reprints without written permission.